Zero delay wireless monitoring from HDMI or 3G-SDI video sources. Long range, high bitrate wireless monitoring from 3G-SDI video sources. COLR is a real-time LUT box, camera control bridge, and HDMI/SDI cross-converter in one tiny package. The professional solution for mission critical streaming over bonded network connections. IP video management suite for professional broadcasters. The world’s first high-performance WiFi access point built for the video industry. Stream live HD video from your camera, video switcher, or DIT to multiple iOS/Android devices on set. 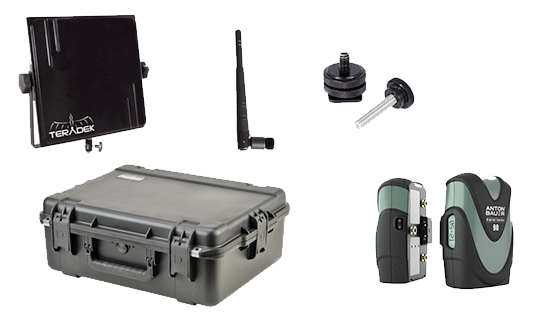 We also stock a complete range of Teradek Accessories and Bits such as Battery Adapter Plates, Battery Packs, Power and Adaper Cables and Antennae. Please note: Nodes are not included and must be purchased additionally if needed. COLR is a real-time LUT box, camera control bridge, and HDMI/SDI cross-converter in one tiny package. COLR integrates with Pomfort LiveGrade Pro, allowing DITs and colourists to give everyone the right look. COLR Duo is a wireless camera control bridge and 2 channel LUT box, with support for 2 independent 33pt 3D LUTs. COLR Duo integrates with Pomfort LiveGrade Pro, allowing DITs and colorists to give everyone the right look.